Newly filed court documents reveal longtime Rhode Island mobster Robert "Bobby" DeLuca is set to testify that his brother, Joseph, was inducted into the mob shortly after disposing of a body for former mob boss Francis "Cadillac Frank" Salemme. Salemme, 84, is charged with murder of a witness for the 1993 gangland slaying of Boston nightclub owner Steven DiSarro. A flurry of court documents filed ahead of next month's trial in Boston reveal what the DeLuca brothers are expected to say in their testimony. One document filed last week by prosecutors from the Massachusetts U.S. attorney's office states Bobby DeLuca will testify that Salemme elevated him to "capo" - or mob captain - in 1990, and "Salemme also 'made' DeLuca’s brother, Joseph, shortly after the murder of DiSarro." It marks the first time the government has publicly identified Joseph DeLuca as a made member of the New England La Cosa Nostra. Steven O'Donnell, a law enforcement analyst for Eyewitness News who used to investigate organized crime for the R.I. State Police, said the DiSarro murder likely explains why Joseph DeLuca was inducted into the mob. "To shut him up, basically, to be quiet," O'Donnell said. "When you get sworn in you swear an oath of silence, 'omerta,' that you never talk about it ... bring him in so in their mind that would help silence him." "Obviously that's not happening today," he said. In the filings, prosecutors say Bobby DeLuca will testify that his brother volunteered to meet with Salemme alone, and to dispose of the body. Joseph wanted to go without Bobby because "he was concerned that his brother had small children and might be caught," court documents say. Investigators say Joseph DeLuca met Salemme at a pharmacy in North Providence, then drove with him to a nearby jewelry manufacturing plant where DiSarro's body was transferred to DeLuca's car. It was then buried by Joseph and two other unnamed people behind a mill building on Branch Avenue in Providence. Land records show the building was owned by William Ricci, a longtime associate of Bobby DeLuca. The DiSarro cold case was reinvigorated when Ricci confessed to the FBI, following his arrest in a separate case in 2015, that the body was buried on his property. As Target 12 first reported, the FBI exhumed DiSarro's remains in March 2016, and Salemme along with codefendant Paul Weadick were charged a short time later. Salemme, his son and Weadick were revealed to be silent partners in a South Boston nightclub called The Channel, which was officially in DiSarro's name. Investigators allege Salemme's son - who was under investigation at the time - was growing concerned at the time of the murder that DiSarro was cooperating with the FBI. "Similarly, Robert DeLuca will testify that Salemme expressed concerns that DiSarro was stealing from them," prosecutors wrote. "According to Deluca, he told Salemme he should 'get rid of him' meaning he should fire DiSarro." Prosecutors say Deluca will tell a jury that Salemme responded, "well Frankie Boy will take care of that." 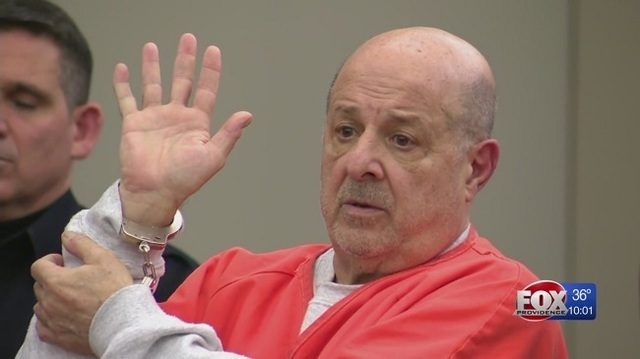 Bobby DeLuca has already pleaded guilty to lying to federal investigators about what he knew of the DiSarro case and will be sentenced after he testifies against Salemme. O'Donnell said DeLuca's checkered history with the truth makes him a difficult witness for prosecutors. "Bobby DeLuca has testified in court that's he's lied, he's pled that he lied, and also 20 years ago he's had a different version of the events," O'Donnell said. "It's a battle of credibility." But he said prosecutors have lined up other witnesses who will corroborate DeLuca's story. "That's just what a jury will do, they will decide if somebody lied, are they lying now or were they lying before?" O'Donnell said. "That's the beauty of a trial - letting them figure out what they believe is factual." As Target 12 previously reported, Joseph DeLuca was granted immunity from prosecution. Salemme and Weadick have both pleaded not guilty to charges. Salemme's attorney, Steven Boozang, did not immediately return a call for comment but has previously said his client is looking forward to taking this case to trial. Jury selection is set for the end of this month with opening arguments on May 9.